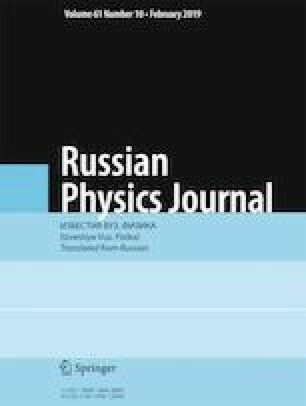 The paper presents research into the structure and phase composition of Ni–Al–Co alloy modified by rhenium (~3 аt.%) alloying. Observations are carried out using the transmission electron microscopy. The initial state of the alloy is the state after the directional crystallization. The alloy is further subjected to 900°С annealing during 1143 h. Creep tests are additionally carried out for this alloy at the same temperature and time and 400 MPa load. It is shown that FCC disordered γ- and ordered γ′-phases are major in all alloy states. Secondary phases are found to be σ-phase, χ-phase, Laves and AlRe2 phases. Experiments show that the high temperature annealing changes the phase composition of the alloy. Thus, the amount of the ordered γ′-phase increases, while that of disordered γ-phase decreases. During the creep process, the amount of the former reduces and the amount of the latter increases. The annealing process modifies the phase composition in secondary phases. It is found that the structural modification caused by the creep process differs from that caused by the annealing process. Thus, the creep-induced modification of the cuboid structure in γ′-phase is stronger than due to annealing. Dislocations are observed in γ- and γ′-phases in all states of the alloy. During the annealing process, the dislocation density in γ-phase is higher than in γ′-phase, and vice versa during the creep process. The experiments show that the behavior of the dislocation structures is different during the annealing and creep processes. Translated from Izvestiya Vysshikh Uchebnykh Zavedenii, Fizika, No. 12, pp. 65–71, December, 2018.